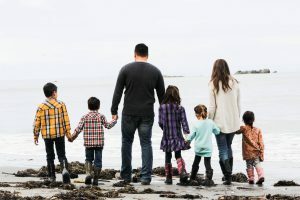 As my homeschooling vision and style has become more streamlined over the years, my idea of what preschool should be has changed drastically. When I started out, I thought preschool should be a short introduction to school. And I thought school should be exactly what it was in the public school, complete with little desks and ideally me standing in the front with a teacher hat and wooden pointer. 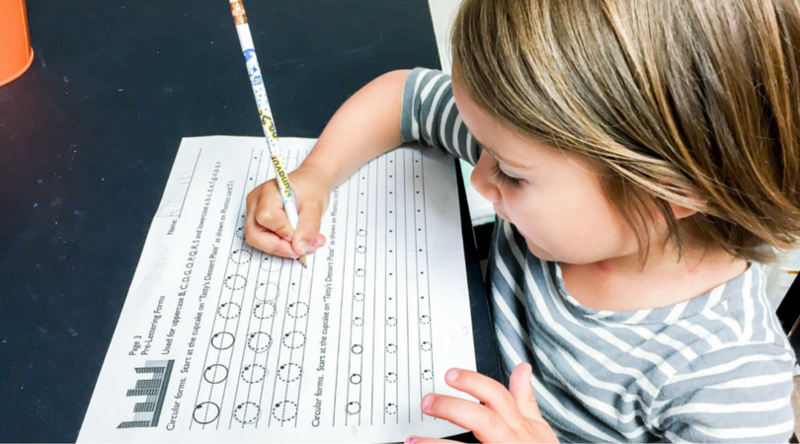 Preschool therefore should be short but intense little bursts filled with little workbooks and learning how to follow instructions, building their stamina for sitting, helping them develop their attention span, etc. By the end of preschool my child should know their letters, the sounds they make, their colors, and their shapes, right? Fast forward 6 years, and I affectionately roll my eyes at that deluded young mama. My vision of preschool now is all about the fun, going with what interests and excites my little 3 or 4 year old. I have fallen in love with the Charlotte Mason philosophy of educating the whole child. Whether that means they are enamoured with workbooks or don’t want a second of formal education… I’m all about rolling with the punches now! They also have Themes (which incorporate your Bible, Socials, and Science into one common theme study) and Language Arts all the way from Preschool to High school, so if you love the approach of this company, you are sure to love their other resources as well! Each of their programs are highly interactive and include a TON of crafts and activities, games, journaling, videos/links to explore and more! One easy guide clearly lays out exactly what I need to do for the week with an easy weekly planner layout. This means that WinterPromise is great for mom, with little prep and stress, and great for the kids, being fun and engaging! Head on over and use coupon code: HipHS for 5% off ANY of their programs using the link below! There is one “themed program” that we reviewed called, “I’m Ready to Learn” and one Language Arts program, “Letters to Little Words“. The theme covers their socials, science, math, and Bible. There is a week at a glance page, then daily pages that are separated by subjects. Any worksheets you need are right there so it really is open and go. When you purchase your theme you also purchase the add on books such as your art books, your read aloud book, your science books, your Bible, etc. They all go along with the program to make it a “complete” curriculum. 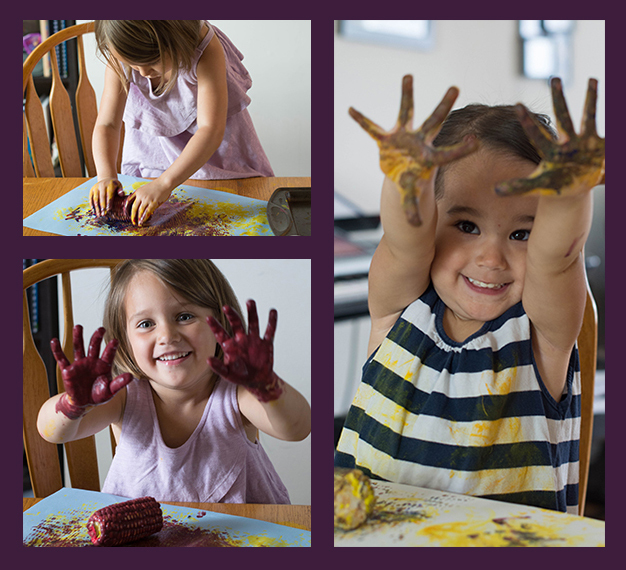 Painting our own corncob impressions: LOTS of hands on art! Why is the language arts separate from the main theme? 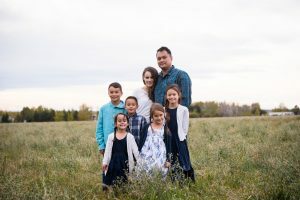 In an act of genius, WinterPromise separated their language arts programs from their themed programs. This way children can find the level that best suits them without being bound to a specific “grade level”. We tried “Letters to Little Words” with her and she loved it. 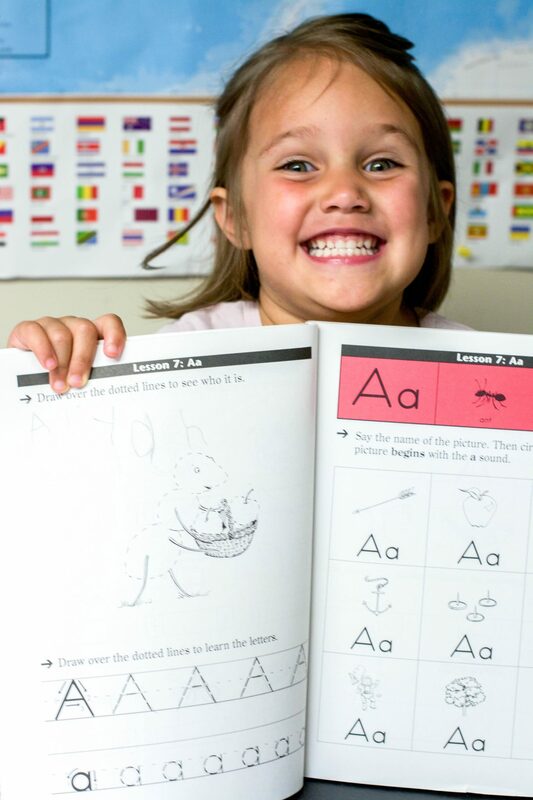 The language arts program has flashcards, workbooks (including Get Ready for the Code and Jump Right into Reading), handwriting pages, a hands on activity pack and make your own readers. The language arts guide is set up much the same as the theme with a week at a glance page that tells you what worksheets your child needs to do from the various resources you have. The language arts program (for the month we have been using so far) consists of reading from your read aloud for the day, doing about 2-3 different worksheets, working with your flashcards and then doing hands on activities with your activity pack that is included as well as various life skills (such as writing your name, discussing how to make a phone call, what to do in an emergency, etc). So far, while my little keener is loving this program, she is struggling with sitting still and therefore listening to a chapter book is exceedingly monotonous for her. Because of this, we have cut the read-aloud portion and instead read picture books that are bright and short and engaging. Make a Letter Language Arts Activity Pack: packed with hands activities to teach children about their colors, letters, and more! 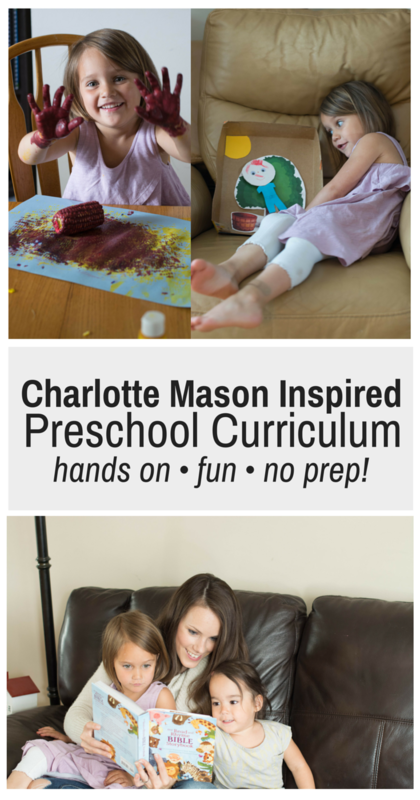 The great thing about this Charlotte Mason inspired Preschool curriculum is that it has SO many activities to choose from, that you can really tailor it to your child. Maybe your son or daughter will be completely opposite from mine and struggle with the worksheets and yet love the hands on component. For these children you may want to break up the worksheets or just frankly do less of them. The guide lays out the ultimate way of using the program and you can tweak it to really fit your family. If you are not sure what learning style your child is, that is SUPER helpful when looking at curriculum to know if they will respond better to reading/writing, listening, or doing. You can take the easy learning style quiz here. Want to see a sample of the pages? Click on the image below to see some sample pages and get a better idea of how it is laid out! 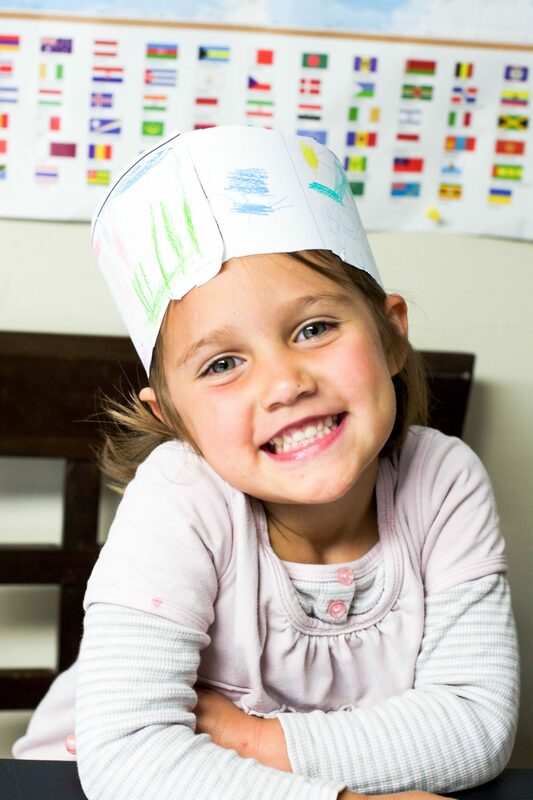 A preschool program that is as fun to teach as it is to learn! My favorite thing about this program is not just that it is easy to teach, or that it is open and go, or even that there is no real prep involved… but rather that it is FUN. I have used preschool curriculum in the past that is highly teacher intensive and quite frankly draining. With 3 other kids to focus on school for, I needed something that I didn’t have to think too much about. 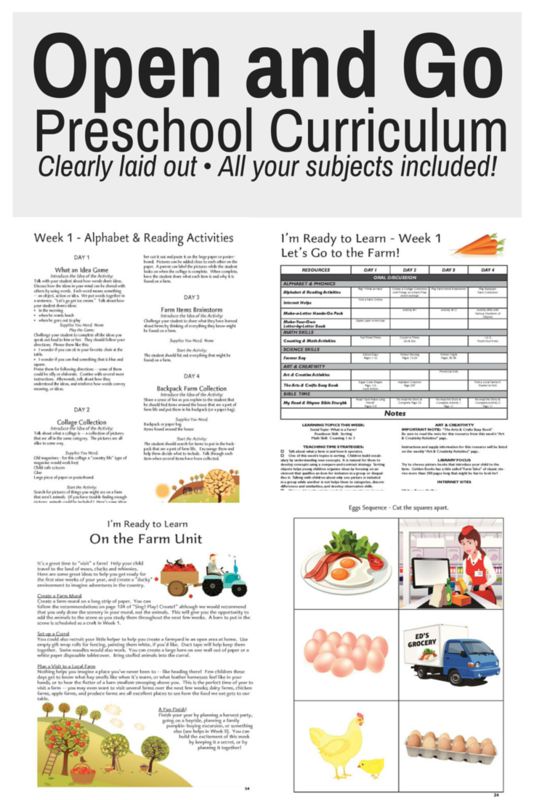 I have tried preschool curriculums that got the job done, but were a fight each day. With WinterPromise, my daughter BEGS to do her school. And I honestly can’t wait to do it with her either! It is one of our favorite times of the day. We close the school room door and shut out all the crazy of life and we sit side-by-side at the table and just talk, and learn, and laugh, and create together. A daily schedule crown, we coloured out the things she does in a day and made it into a crown! It only takes us about an hour to do each day, after only a month, she already knows SO much. It is now the first subject that we teach in the morning and I treasure every minute of it. 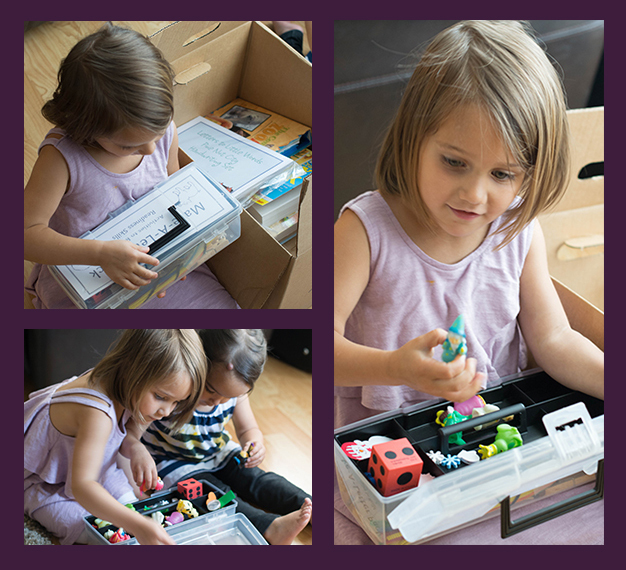 If she gets a bit overwhelmed with something, we wait and she takes a break, and inevitably she wants to do it again later while the big kids are doing their school. I love watching her eyes fill with wonder. I love giving her my undivided attention. And I especially love the conversations that it sparks between us! I wouldn’t trade in our preschool hour for the world and I can’t imagine another curriculum that could ever compare with this one! A picture matching card activity we made together. Let the glue and scissors fly! 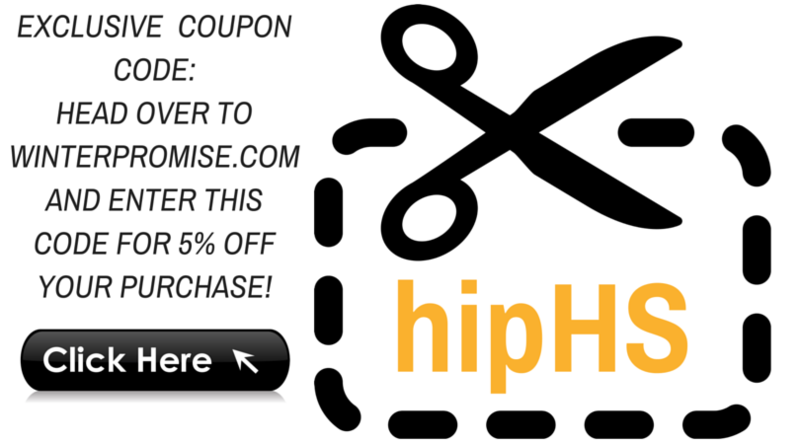 Get 5% off on ALL Themes and Programs at WinterPromise! Whether you have a child in preschool or are looking for something for an older child, WinterPromise has something for you! I am so excited to be able to offer you an exclusive 5% off coupon! This isn’t available anywhere else! I want to point out that I am NOT an affiliate with WinterPromise. That means that I am not trying to get you to buy in order to earn a commission. Instead, I have fallen head over heels in love with their company, their vision, and the value of their products and contacted them to see about a coupon code that I could share in my review. The first review of many by the way, as I know you are all excited to see how the program progresses and what else they have to offer.. I love that the names of the programs really help you figure out where to place your child. For example, even though my son is going into grade 2, he is really still in the Syllables to Sentences stage where he is sounding out words and we are hoping to move forward. Although it gives me a guide that this is for kindergarten or advanced kindergarten, it would definitely be where I place my almost 7 year old! You can learn more on the website but if you have ANY questions, PLEASE post them below! Wondering about where to place one of your kids? WinterPromise has curriculum all the way up to grade 12, so comment below and let’s get started! Hi, I got so exciting reading that your in Canada! Made me think Winter Promise is as well. No such luck. What age groups do you use Winter Promise for? It goes all the way up to grade 12! So you can use it for any age. I am reviewing Adventures in the Sea and Sky next and it is for grades 3-9, it is a themed approach covering Science, Socials, Bible and then you just need to choose your LA level to add to it and math. We are thinking we’ll use it next year for my son who will be going into grade 5 next year. It sounds like a very good curriculum and l would like to try it. Hello! First of all, thank you for writing this. It was exactly what I was hoping to happen upon this morning. I have a few questions. My 3 year old son is showing signs of really wanting to engage and starting learning in a more structured way, so I started searching for ways to do so (and this is when I stumbled on your site). With that said, it’s the middle of the school year (early January), and I am curious if that will put a wrench in the schedule of starting and finishing the curriculums as Winter Promise intended? I am guessing they have seasonal activities included (maybe? 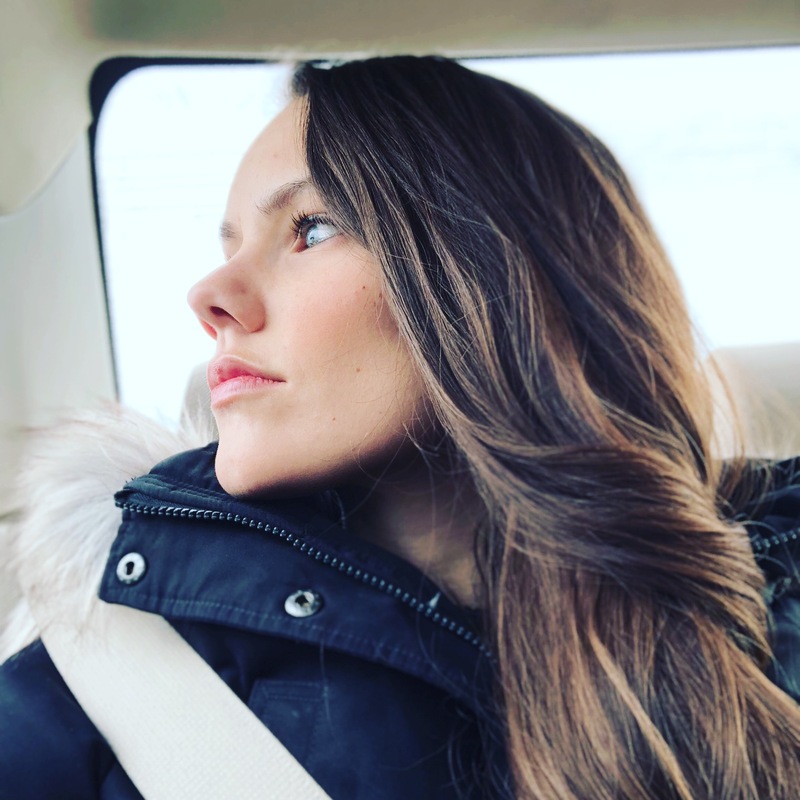 ), and so I am worried that if we started at the beginning of the curriculum that they’d have us doing fall activities vs. winter–the season we are in. Is that something to be concerned about or that I’ll have to adjust? Also, what was your reasoning for going with the “I’m Ready to Learn” program and “Letters to Little Words” for your preschooler? I see that the Winter Promise website suggests pairing “I’m Ready to Learn” with their “Journeys of Imagination” reading program, so I’m curious as to why you chose not to do the Journeys program and opted for the Language Arts program instead? Thank you! Thank you for this!!! I have a 2 year old who will be turning 3 in July and I look forward to using this for the Fall. I am super excited and I have been working on the basics with her and she is doing really well so far. I just needed something more challenging and this is perfect. Thank you again! Ive been looking at Winter Promise for a while now. Thanks for the coupon code, that really helps out when you have 3 kids. We’re really looking forward to doing Animals and their Worlds this year for our 3, 6 and 7 year old. Yes it is! CM inspired! You can either call them and they’ll walk you through what package you should get or I can tell you if you want? Are you looking for print or digital? And what LA do you want with it? Preschool or Kindergarten? My boys are turning 3 in December I was curious where they should be placed? (Should I wait until next year??) I tried their website and it leaves a lot to be desired as far as information on the pre-school “themes”. I was also curious about price. This sounds very interesting. I’d like to look at it. Did you end up using the older level? What did you think about it? I love the looks of the program! Thank you for your review. I have a 2.5, 3.5, and 6.5 year old and am debating how this would work for us. I suppose I’d have to teach them all separately? I would love to order the curriculum! How do I do this? Thank you! Hi, thanks for your indepth reviews. How focused on religion is this program? I’m looking for a secular program but if it’s easy to separate it may still work for me. Thanks! Hello! I’m wanting to start pre-school with my 3.5 year old! We have a 1 year old and a 3 month old… life is CRAY! I’d love any advice and placement information you may have! Thanks! This really looks wonderful! I have been going back and forth between various options for my youngest, who will be 5 next year. We are doing My Father’s World Voyage of Discovery this year. I have been considering their Kindergarten, but this looks really good! I think the K-2 looks too advanced for him, though. Do you think the I’m ready to learn level could be used for Kindergarten? I was just wondering if you have a picture of all that you receive when you order the PreK Ready to Learn package from WinterPromise? I can see the list of what is included but I am such a visual learner and it is easier for me to understand what we will get. If you could add it to this blog post or send me an email I would be really grateful. 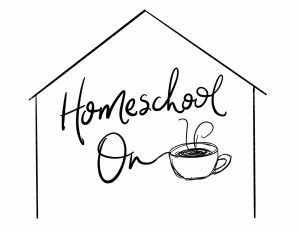 As a family we are really considering this program for the start of our Homeschooling journey.